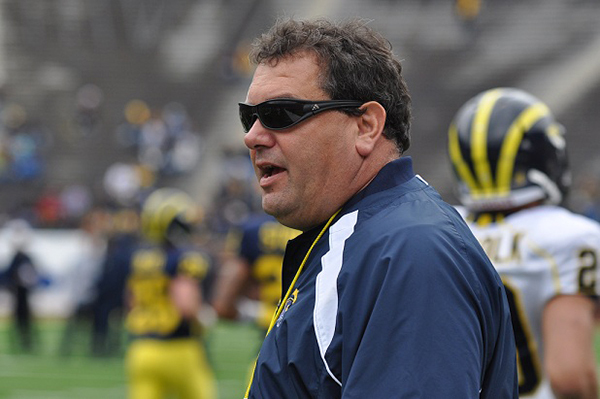 The worst thing Brady Hoke did last year (there weren't many things) was go 11-2 with some help from smoke and mirrors. Commanding losses to MSU and Iowa speak for themselves, but Michigan survived by the teeth of their skin against a crappy Notre Dame team, a crappy Ohio State team, and inexplicably beat Virginia Tech in the Sugar Bowl. This could just as easily have been an 8-5 unit last year. We were not. For that, we rejoice. Unfortunately, Team 133 enters the 2012 season with lofty expectations--ranked 8th in the country--and with one of the more difficult schedules to boot. Michigan is on the road against Alabama, Notre Dame, Purdue, Nebraska, Minnesota, and Ohio State. The only home matchup Michigan has against a top-level opponent is a rebuilding Michigan State team that frankly, the Wolverines would beat in East Lansing. The point is, the schedule does not set up well for a team rebuilding its offensive and defensive lines and with shaky depth at just about every position ont he field. Though bye weeks aren't quite as beneficial the following Saturday as you would expect, to add to scheduling frustration, Michigan takes the week off before the Purdue game. Purdue. Before I started writing this, I was convinced this team would top out at 8-4, but I'm in a good mood, so 9-3 seems attainable. Alabama is a certain loss. Notre Dame is probably a toss up, depending on whether or not Brian Kelly can pick a decent starter from his gaggle of mediocre QBs. And Ohio State is, well, probably a loss. While Urban Meyer will turn his current roster into something special eventually, Braxton Miller is still the kid that led the team to a 6-7 record last year and probably still can't complete a pass. But it's in Columbus so, loss. The rest of the games seem like lock wins (Air Force, UMass, @Minnesota, Northwestern) or at worse 60-40 Michigan wins (@Purdue, Illinois, MSU, @Nebraska, Iowa). Now, this is college football and an injury to Denard means 9-3 instantly becomes 6-6. But we're functioning under the impression that God wouldn't do that to us. Right God? Right? Do I really feel like Michigan will end the season at 9-3? Probably not. The chances of the team upsetting Alabama, Notre Dame, or Ohio State--all on the road--are pretty slim. But the chances of at least one of Iowa, MSU, or Nebraska beating the team are relatively high; they're all more or less on the same talent level. Last year, I created a tag on this blog called "Al Borges' diabolical machinations" after he did this against Northwestern. Much like the QB-play action isos that Rich Rodriguez used with Denard in 2010, Borges takes great care in setting up the defense for easy touchdowns and big plays. They haven't been quite as successful as Rodriguez's (or at least, they haven't produced the same big-play results), but they've certainly been a staple of the offense. 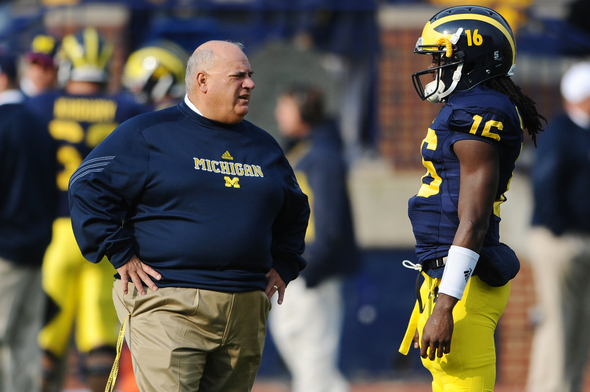 Borges is now working with a senior Denard in his second year in the system. While I'm skeptical that he can totally fix Denard's myriad problems in the passing game, another year of learning and training should see Denard eliminate at least a few of his notable flaws. Perhaps just as importantly, though, Borges now understands how to use someone like Denard, which he struggled with at times throughout 2011. Games against MSU and Iowa saw the offense reverting to an I-formation, downhill attack that simply doesn't suit Denard's talents. As the year progressed, Borges and Denard both got more comfortable with their partnership and the offense improved noticeably. Another reason for the offense's uptick in effectiveness was the emergence of Fitzgerald Toussaint as a premiere running back. Toussaint separated himself from the logjam of backs on the roster to become the clear favorite and Michigan's first feature back since Mike Hart left. His return this year (which will likely come after the Alabama game whenever Hoke gets around to suspending him) will help give the running game the kind of two-pronged attack that it never had under the previous regime. The other moving pieces on the offense are less impressive. The wide receiver corps is pretty much decimated save the inevitability of Devin Gardner moving to wideout. The offensive line replaces the Rimington winner and shuffles a few pieces. And the tight end position is a holy mess. In spite of all of that, barring injury to Denard and in expectation of a permanent move of Gardner to wide receiver, expect a statistically consistent offensive performance from 2011. If Denard can cut down the turnovers, the offense could start to reach its 2010 levels, but that's unlikely. Expect an output similar to last year without the cratering performances against teams like MSU and Iowa. Breakout star: Elliott Mealer. I know people are really worried about the offensive line and whether or not Mealer will hold up at left guard, but I'm a lot more positive on his outlook. Mealer was a 4-star, top-250 Lloyd Carr (this is important) recruit. When Rodriguez came, he opted for speedier, more athletic linemen, and Mealer was still recovering from the car crash that paralyzed his brother. As his career wore on, the starting offensive line became one of the strongest units on offense. If he labored on the bench last year and the line wasn't pretty stellar (barring the occasional Mark Huyge implosion), or in desperate need of tackle depth, I'd be more concerned about him. I imagine Mealer holds the position the entire year and we're all pleased with how good of a run blocker he is. Most disappointing: If I could put Al Borges here, I would. I'm worried he'll lose Michigan at least one game trying to go back to I-formation football. I hope not. In lieu of that cop out, probably Jeremy Gallon. Gallon was Michigan's second-leading receiver last year and has the kind of shakes that can cause havoc for a defense in the open field. Unfortunately, now that he's the nominal #1, defenses will start paying more attention to him, so doing things like disappearing against ND to set up the winning touchdown will not happen. I'd imagine his receiving stats drop considerably this season. 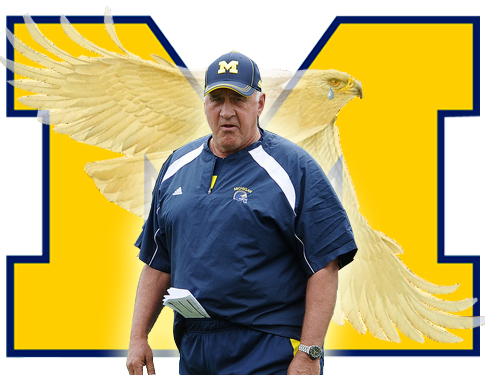 Last year, Greg Mattison--henceforth known as The Silver Eagle--descended from the NFL to resurrect a Michigan defense that was very, very bad. In doing so, he proved a few things: 1) Michigan's defensive players were not terrible 2) Greg Robinson is the worst thing ever to happen ever and 3) he is a defensive schematic mastermind. I wrote a post last year called Obligatory Slobbering Mattison Post in which I just diagramed the variations on Michigan's "Okie" package (a stand-up, zone blitzing scheme) that he deployed against poor, unsuspecting Nathan Scheelhaase. He later admitted that many of the variations were stunts that the players themselves had ad-libbed during the game, but it was still an impressive turnout. This year, the defense replaces most of the defensive line and that's about it. The entire secondary returns, as do the linebackers. Unfortunately, because Rich Rodriguez was not such a fan of recruiting defensive (or offensive for that matter) linemen, the men stepping into the starting lineup are unproven or have had careers speckled with only intermittent quality plays. While most people are concerned with the performance of the defensive line, I'm actually a little more hopeful. On the interior, Will Campbell and Quinton Washington need to hold up against the run. Getting pass rush from them isn't necessary, and as long as they can hold their own against double teams, the experienced linebacker grew should be able to make the proper reads and tackles in the rushing game. On the edges, Craig Roh moves to the strongside defensive end position where he will try to impersonate Ryan Van Bergen all year. I'm relatively confident he can do that for no other reason than he's given me no reason to think he can't muscle up against tight ends and double teams. On the weakside, Jibreel Black steps into the rush end role. Though he bulked up for a potential move to DT, I think his size could be a huge asset. If Black can't rush around an offensive tackle (which he won't be able to do against the more talented tackles in the league), I fully expect him to be able to bull rush through them. With his bulk and 6'2" frame, getting leverage on and bull rushing tackles should be his specialty before cutting inside--this will open up running lanes on the outside against mobile quarterbacks, but we'll cross that bridge when we come to it. Given Mattison's ability to get to the quarterback with essentially any personnel (his blitzes' success seems independent of who's rushing), and Michigan's general lack of pass rush from the front four last year, I don't expect too much of a falloff this season from the defense. With an improved linebacking corps and an experienced secondary, coverage sacks should improve, interceptions and PBUs will come more frequently, and experience in the system will limit running lanes to the outside. The biggest downfall will probably be a lessened amount of recovered fumbles, but those are largely uncontrollable. MVP: Jordan Kovacs. This is actually a little troublesome. Last year, you could reasonably argue that Mike Martin was the defensive MVP--he was certainly its most talented player. While I have endless amounts of faith in Kovacs, if there aren't any stellar playmakers on defense, this team will epitomize bend-don't-break football. That turns a 9-3 season into 8-4 or 7-5 at worst. Breakout star: Jibreel Black. See above. Most disappointing: Desmond Morgan. While he had a decent freshman year, I don't see the upside in Morgan's game. Given his lack of athleticism, I'd imagine James Ross surpasses him sometime during the season. There is no way in hell we are losing to Ohio. Take that back right now. You see MSU as a lock win? As a team that beat us pretty decisively last year, they retain a lot of key players or have solid back-ups fitting into place. The receiver situation isn't great there, but not really much worse than ours, and there really is no reason to believe Maxwell won't be a fully operation replacement (albeit less battle tested). Of any team other than 'Bama on our schedule this year, I would rate that one as mostly likely to lose.